One of the first images we see in Good Time is a closeup of Nick Nikas’s (Ben Safdie) expressive eyes, with pain and confusion flashing behind them as he is given a mental examination. Nick is a young man with a developmental disability, and though he gives seemingly vague answers, the questions being asked by his psychiatrist (Peter Verby) clearly hit a nerve, and a tear starts to roll down his face. It’s a heartbreaking, devastating image that puts an emotional undercurrent on the entire film. By the time the camera pulls in on a different pair of eyes near the end, the context now changed but powerful similarities existing between the two images, we have been taken on a true ride by this feverish, absorbing and exhilarating crime thriller about brotherly loyalty. But let’s get back to that opening scene, which takes a turn when Nick’s older brother Connie (Robert Pattinson) bursts in, pulling him from the room. Connie needs his brother’s help to pull off a brazen bank robbery, and thus begins the incredible opening sequence of the film. Staged at a frantic pace, we watch as the brothers bolt through the streets with a bag of stolen cash, the camera putting us right there with them as they desperately try to avoid the circling cops. When Nick ends up getting arrested, and Connie evades capture, he gets in even deeper than before, needing to track down enough money to pay his brother’s bail by night’s end. Directed by filmmaking brothers Joshua and Ben Safdie, the latter of whom also co-stars in the film, Good Time is an exhilarating experience. Taking place over a single night, and embracing the scuzzy underbelly of its Queens, New York setting, the film has a live wire energy to it that never lets up for the entire running time, matched by its unpredictable leading character. Connie is a hustler, a character who bullshits his way through any situation, while convincing himself he’s doing the right thing. But this also happens to be the night when his lies are starting to catch up with him, and he’s destroying his life in the process, while also taking a litany of others down with him. Robert Pattinson is outstanding in the role, delivering an intense performance that just might be his best work yet, breathing fiery life into this manic small time criminal who lives his life moment to moment and only barely hangs on by the skin of his teeth. There is a wildness behind his eyes that makes him transfixing to watch, and the dedication he has to his brother is almost noble, even if he has misguided ways of showing it. Although he might be ill-equipped to properly care for Nick, he sure as hell isn’t going to let him waste away in a facility either. Ben Safdie delivers an equally remarkable performance, respectfully portraying his character’s disability in a brilliantly understated way, and evoking genuine sympathy for this man who ends up caught in the cycle of crime. The cast is rounded out by memorable supporting turns from Jennifer Jason Leigh as Connie’s older girlfriend who seems to have her own issues, Taliah Webster as a teen girl who becomes an unwitting accomplice to his plans, Buddy Duress as an ex-convict who gets in way over his head, and Barkhad Abdi as a poor security guard just trying to do his job. This is a film that is as exciting visually and sonically as it is in terms of characters and performances, with illusions to both Michael Mann and Martin Scorsese in terms of its sense of style. The exceptional techno score by Oneohtrix Point Never pulsates throughout the film, upping the sense of danger and unpredictability that lurks behind every one of its corners. The electric camerawork further draws us into the grittiness of this world, with the look of the film balancing the dark murkiness of the city at night, with some striking splashes of colour like the red of Connie’s jacket. There is a feverish, up all night energy to Good Time that makes it a blast to watch, and it even pulls off a really great twist about halfway through, segueing us even further into the hazy, drugged out world that these characters exist in. The film builds and builds to a fever pitch, before culminating in a bittersweet final scene that continues over the end credits, and gives added meaning to the title. The result is an exhilarating modern crime drama, that delivers an acid-fuelled cinematic trip well worth taking. 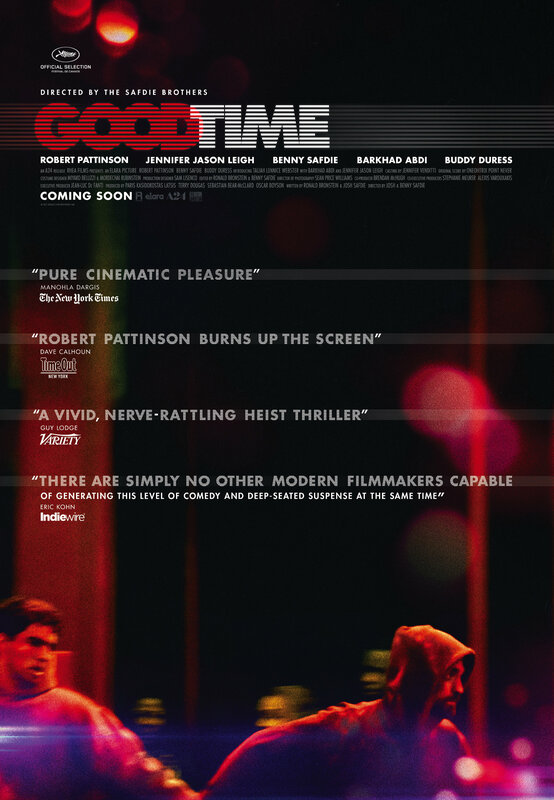 Good Time is now playing in limited release at Cineplex Cinemas Varsity in Toronto, and will be expanding to more theatres across Canada next week.